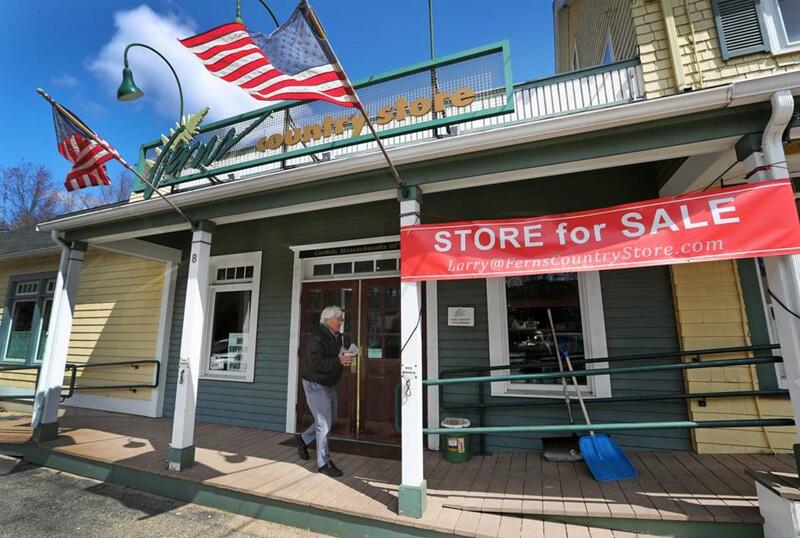 As the owners of Ferns Country Store in Carlisle get ready to retire, who will pick up the reins? Stop by Ferns Country Store on a spring morning and you can almost imagine the days a century ago when the wooden rocking chairs on the front porch held garrulous old farmers exchanging crop tips while ladies sipped tea at the wrought-iron tables on the adjacent patio. You can imagine it, but you’d be wrong. Ferns Country Store may look like a centuries-old general store, but in reality, for much of the past several decades it was merely a dowdy little market with a sandwich counter, a place for kids to stop after school for a candy bar or commuters to grab a quart of milk and continue on their way as quickly as possible. Only since Larry Bearfield and Robin Emerson, a local couple who share a background in advertising, purchased bought the wood-shingled storefront in Carlisle Center in late 2003 has it been a picturesque hub of community life. Where once stood a bare-bones deli counter and a rack of newspapers, locals and out-of-towners alike can now sit down for homemade soup, sip artisanal coffee, even buy (and consume) a bottle of wine. It all appears so natural, so atmospheric, so effortless. Almost . . . Disneyesque. Yet just like Disney World, it takes a lot of work to make everything look so authentic. 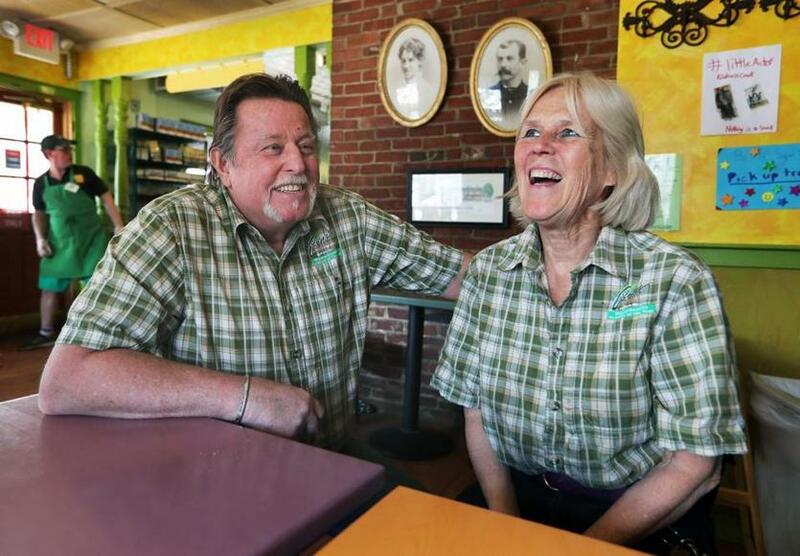 Bearfield and Emerson, both in their 60s, are understandably ready to retire. In late 2017, they made the difficult decision to put their business up for sale, and in the months since have been actively searching for someone else to pick up the reins. And as a lifelong Carlisle resident who has seen the transformation of this little spot from a musty grocery outpost to a gleaming boutique café, I’m worried. Larry Bearfield’s and Robin Emerson’s Ferns Country Store is a Carlisle treasure. “It’s not rocket science,” remarked Bearfield when I expressed my concerns about the store’s future. Though I appreciated his modesty, I couldn’t overlook the fact that he has a vested interest in putting forth the message that anyone with some capital and some time could do what he and Emerson have done. And I’m not sure I believe him. Supervising staff, stocking inventory, making sandwiches, cleaning the coffee maker – sure. That part might not be easy, but anyone with enough of a commitment to its financial success could probably figure it out. The problem is that Bearfield and Emerson’s secret sauce is their unflagging devotion to the community. And we simply cannot expect that an investor who hopes to run a profitable general store will be willing to make the kind of effort the two of them have made over the years. Ferns Country Store sponsors and organizes the town Christmas tree lighting celebration. It provides a free venue for fund-raising efforts, ranging from seventh grade spaghetti supper tickets to Girl Scout cookies. It offers live music and wine-tastings on Sunday afternoons. It houses an artists’ corner for cards, jewelry, chocolates, and other specialties made by local craftspeople. It gives veterans complimentary coffee on Veterans Day and serves free lunches to the DPW crew when they are up all night plowing snow. The small town of Carlisle, with its lack of affordable housing, dismal record on diversity, and almost impenetrable restrictions on zoning, may seem exclusive at times, but Ferns always feels inclusive, its daily traffic a continuous stream of seniors meeting for coffee, construction workers and utility crews taking a lunch break, middle schoolers sitting down for an afterschool snack, harried professionals picking up takeout on their way home. And seeing this demographic kaleidoscope pass through its doors on a typical day reinforces the importance of supporting small businesses. My “buy local” ideology can at times fall prey to the need for convenience, as I guiltily click the Amazon order-now button rather than making my way to the nearest independent bookstore or leaf through the L.L. Bean catalog instead of taking a trip to the nearby sports boutique. But spending the morning at Ferns reminds me of just how much I’d be missing if Ferns wasn’t here. As a self-employed writer, I meet interview subjects here. For my kids, as with so many Carlisle tweens, Ferns was the destination for their first adult-free excursions with friends. When we want to give out-of-town guests a taste of small-town ambience, we have lunch on the Ferns patio. Small businesses matter, and so does our support of them. There may not be another Bearfield and Emerson in Ferns’s future, a couple willing to extend themselves so tirelessly in support of the community. But I hope there will continue to be a Ferns in Carlisle’s future, a scenic little gathering spot for all ages. Life in the suburbs can be lonely. I’m probably emblematic of many adults in that I often find it just easier to seclude myself at home with a pot of home-brewed coffee than put on decent clothes to go out in public. After all, I can keep up with friends and colleagues alike just by opening the browser window on my computer. But Ferns reminds us there is really no replacement, even in today’s ultra-connected society, for a living, breathing community. It gives us a place to interface with one another the old-fashioned way: with eye contact and nuanced conversation, minus the hashtags. What Facebook can never do, Ferns can. But only as long as there’s someone willing to keep the lights on and the coffee hot. 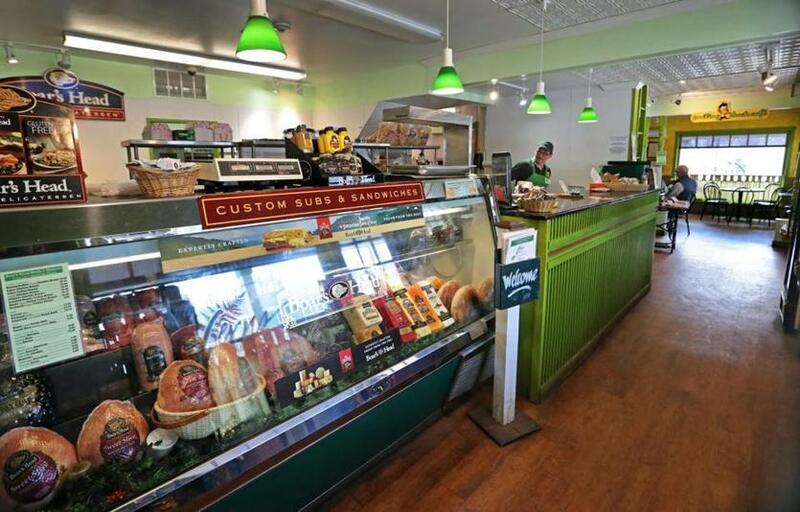 Food is just part of the formula at Ferns CountryStore. 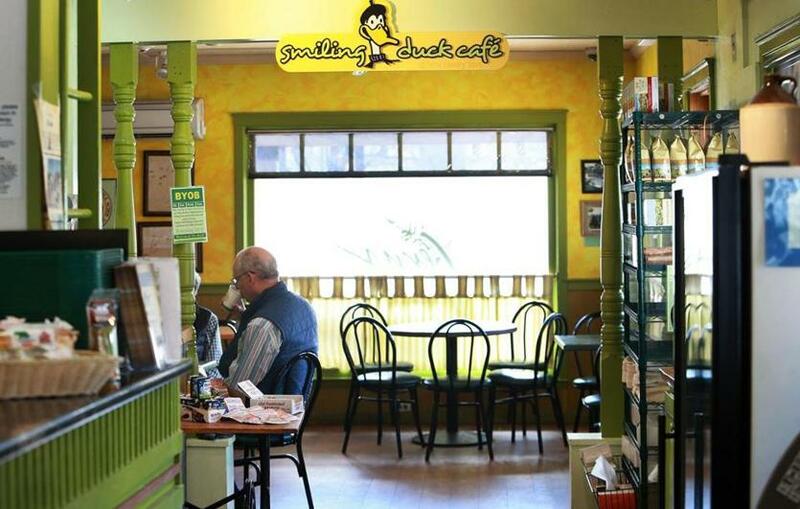 A section of Ferns Country Store is called the "Smiling Duck Cafe." 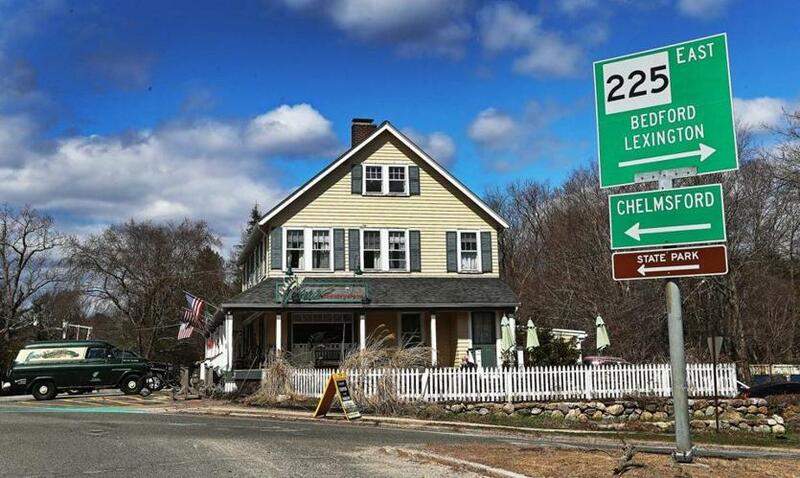 Ferns Country Store is at a crossroads.